After a May Day march about a hundred officers milled about in Foley Square in downtown Manhattan. A police barricade separated them from protesters. White police vans lined the sidewalk. The march was over, and the estimated 1,000 protesters who were there at the peak had dwindled to a small crowd, soon to disperse. The officers kept an eye on the remaining activists. Jose LaSalle kept an eye on the officers. “Too cool man, you’re too cool,” LaSalle said to a white middle-aged man who passed. “So are you!” the man replied. They both laughed. The man, LaSalle said, is a plainclothes officer. “They know me. I know them. Like they study me, I study them,” he said, after the officer had passed. 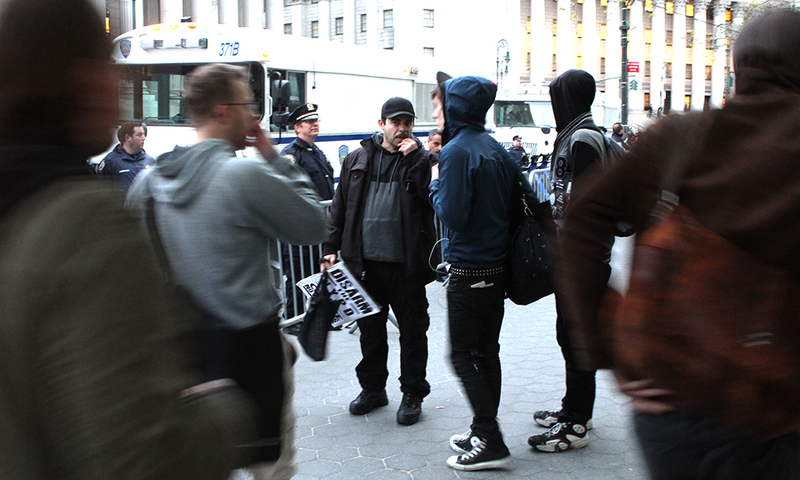 Indeed, many of the NYPD officers at the rally knew LaSalle by name, though none were willing to say so on the record. Policing the police, a tactic known as cop watching, isn’t anything new. Indeed, La Salle reports that there are eight cop watch groups in New York City. But spurred by stop-and-frisk policing, the number of people who document police conduct has increased dramatically in recent years. The tactic has gained even more public attention with high profile cases such as the April police shooting of Walter Scott in Charleston, South Carolina. From the footage, it was clear the police officer was not acting in self-defense when he fatally shot Scott, an unarmed black man, who was running away from him. In the age of cell phone cameras, practically every citizen is equipped to record video evidence as something happens—and with police misconduct at the forefront of the national conversation, more and more police are finding themselves the subjects of surveillance. “[Having video evidence of police misconduct] is taking the power to control the narrative from the police, which in the past they’ve always had,” said David Harris, professor of law at the University of Pittsburgh and leading expert on racial profiling in law enforcement. Harris points to the Scott case. Initially, the officer said that he was acting in self-defense. But the cellphone video proved otherwise. “That officer felt so comfortable making up an entire story, he had no doubt that his story would be believed,” Harris said. The possibility that police might act irresponsibly is why groups like LaSalle’s keep their eyes on the police. 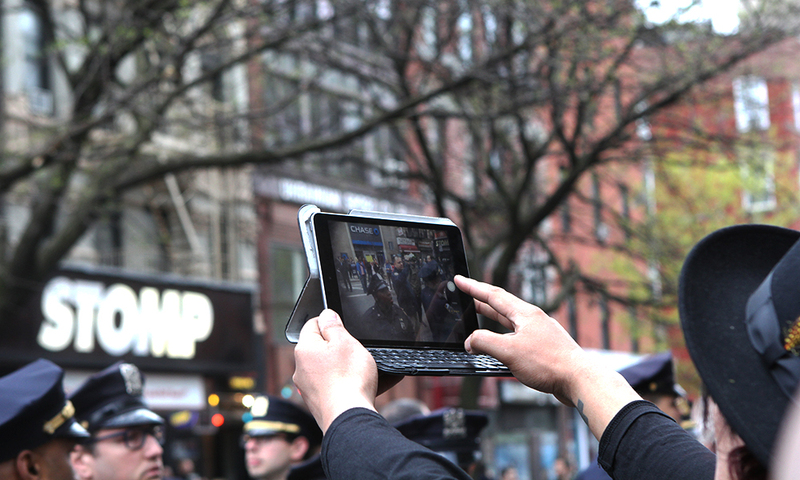 Throughout the three-hour protest in Manhattan, LaSalle and his troops monitored police behavior both by walkie-talkie and by camera. Some of the cop watchers used cell phone cameras, one had an iPad, LaSalle had a Sony 2000x zoom camcorder, similar to what the police were using to survey the crowd. The zoom is strong enough that earlier in the march LaSalle was able to get a clear shot of officers perched on top of towering public housing developments. Citizens don’t have to be official members of a cop watch group though to play their part. Smartphone apps, for example, are now available for anyone to efficiently be able to monitor the police. The newest was released by ACLU California last week, it sends video footage from the phone directly to the ACLU for storage so that it won’t be lost if the phone is seized and destroyed. In New York, there is the “Stop-and-Frisk Watch” app from the New York Civil Liberties Union, which also sends footage for storage. It even alerts users when reports are being filed in their near vicinity. Cop watcher Dennis Flores, a pioneer of the strategy, has been practicing cop watching since the mid-1990s. Then, he used point-and-shoot cameras and handheld recorders. Flores and his troops, known as El Grito de Sunset Park, meet and patrol the neighborhood weekly. He has a core base of 20 members, and about 100 community members who join on occasion, according to Flores. They patrol the streets of the neighborhood armed with cameras—including high-tech GoPro cameras, known for use by extreme athletes, radio scanners to listen in on police communications, and printed information on citizen’s rights to give to members of the community. Having a crew he can trust is key to his success, he says. The group often files legal action against the police too. 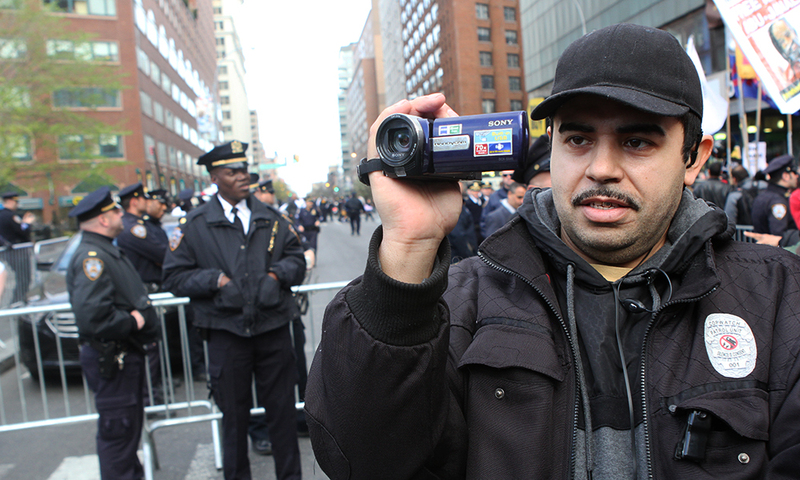 El Grito’s equipment and operating costs, for example, are completely covered by money that the group won in suits against the NYPD. The first case Flores won was also the case that inspired him to train others to cop watch. On October 10, 2002, he saw a high school student, who attended the school where he was a peer counselor at the time, being arrested with unnecessary force. “He was handcuffed already. This cop was mushing his face into the gate. It’s all happening in front of the token booth clerk, in front of everyone. So from a distance I took this digital point and shoot camera and I just started taking photos,” he said. He dialed 9-1-1 and started dictating what was happening to the operator, knowing that all 9-1-1 calls are recorded so he could use it for future evidence. “They started Macing me, they were Macing me while I’m on the phone… They wanted to get the camera from me and to get their way,” he said. “I let them handcuff me. They took possession of the camera and as soon as they locked the handcuffs in, they passed the camera to the cops that just Maced me, slammed it on the floor, started stomping it, breaking it into pieces. They all grabbed a part of me, my arms, my legs, slammed me on the floor, piled on top of me like this was rugby, the only thing that was sticking out was my head, like a turtle. This cop with a walkie-talkie bashed my head open. Jumped on my arms, jumped on my wrists, fractured my wrists, fractured my fingers,” he said. He said he was taken to jail and charged with assaulting an officer. Despite the evidence that he had collected by having the phone call recorded, it took him four years to have the suit settled. Finally, he won $270,000 from the NYPD in a settlement. He appreciated the money and used it as seed money for his cop watch patrol’s equipment, but he felt the city did not get the punishment it deserved. “When you settle a case like this you exonerate the city and the police department and these specific cops of any wrongdoing,” he said. El Grito is not alone in winning money from suits against the NYPD. In 2013, the most recent year that data is available, there were over 9,500 claims filed against the NYPD. Settlements and judgments against the NYPD that year cost the city about $137 million, according to statistics compiled by the comptroller’s office. The NYPD declined to comment on cop watch programs, despite numerous attempts to solicit a statement. Norman Siegel, a civil liberties lawyer and former director of the New York Civil Liberty Union, has done pro bono work with El Grito de Sunset Park, representing people that the group has documented being abused by police. He points out that videotaping incidents does not always guarantee a satisfactory result. “Video makes a big difference, some or most of the time — but not all of the time,” he said. “Sometimes it makes no difference as you saw with Eric Garner,” he said. Despite cellphone video recordings of the arrest of Eric Garner in Staten Island, a grand jury failed to indict the cop who put him in a fatal chokehold. Still, in Sunset Park, Flores feels that he has started to make headway with the police. “It has definitely put the cops on notice. When we’re out on the streets, they disappear. If that’s going to stop them from exhibiting this type of behavior, then that’s a plus,” he said. “Cops should be focused on going after criminals. There are murderers out there. There are thieves. There are rapists out there. Focus on crime, don’t focus on corralling kids around, stopping and frisking teenagers because seeing them in the streets is a disturbance, or because their pants are down low, they’re a bunch of thugs,” he said. Cop watching hasn’t necessarily brought about systemic changes in policing, yet, but with the help of people like Flores and LaSalle, the police can’t quite control the narrative of police encounters the way they used to. Without a Badge is a project of the New York City News Service at the CUNY Graduate School of Journalism.